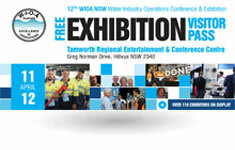 The WIOA NSW Water Industry Operations Conference and Exhibition is coming to Tamworth on 11 & 12 April 2018. The exhibition is the largest water exhibition in regional NSW and provides a chance to discover and research new technology, equipment, services and ideas. See the very latest in treatment and distribution, wastewater collection and treatment, water supply, reclaimed water or biosolids, project management, asset management, development and application of new technologies, training and safety issues from the world’s leading companies.